Sure, a racing car bed with LED lights is more suitable for a boy’s room. However, some girls might appreciate a bed like this, too. On the whole, if you are looking for a solution your kid will love, searching for funny novelty beds is a step that will unlikely go wrong. Another great perk is a double functionality of integrated LED lights. On the one hand, they may serve as a toy element in your kid’s room. On the other one, they can also be used as a nightstand. And the best thing is – LED lights can feature a variety of different colour shades, sometimes – even several interchangeable hues in one model. Racing car beds with LED lights may feature different car ‘makes’ and designs. The colour palette to choose from is simply fantastic – red, yellow, blue – even pink ones for girls – all are easily available in stores. The beds are designed for a wide range of age groups. There are toy looking models for toddlers, and some pretty realistic racing car beds for older kids. Plus, there are certain variations that usually include trucks, police cars, trains, or fire engines. Racing car bed is one of the most compact novelty beds in the market. It is way more space efficient than castles, ships, and other novelty beds. 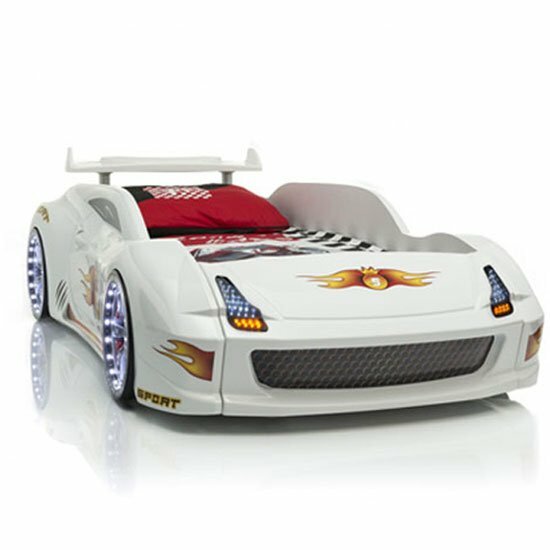 Sure, this is quite a demanding interior decoration solution for your kid’s room, but if you have set your mind on a racing car bed with LED lights, you will unlikely regret it once the decoration is finished. And neither will your kid! Of course, finding an appropriate model might require some time, so if you would like to save your energy, you should better start your search in big store. Browsing through the selection on major e-commerce platforms can prove quite useful, too. However, any time you order furniture online, you should not forget that the delivery time will depend on the location of the company warehouse. If you live in the UK and expect a quick delivery of your purchase, you should visit Furniture in Fashion – a racing car bed delivery will take up to 5 business days, no more.